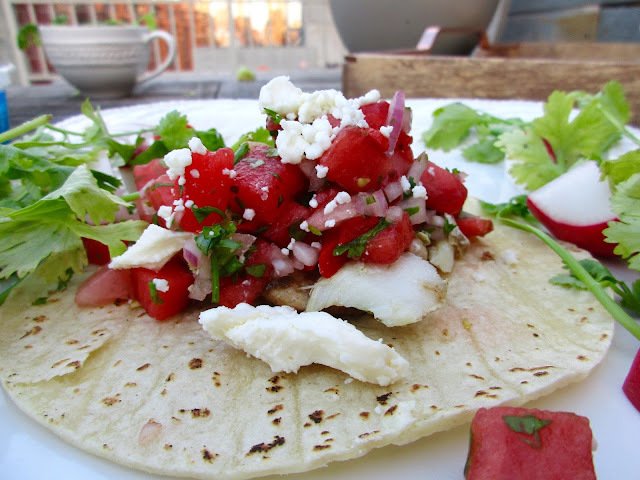 When I first saw the recipe photos for Grilled Halibut Tacos with Watermelon Salsa, I was overcome with emotion—of raging jealousy. What do we have here...the Michelangelo of tacos? Art that uses food as a medium, eh? How many hours did this blogger spent meticulously food styling the dish, from the garnish of tiny edible flowers (really) to the perfectly crisped, U-shaped tortilla edges (never been able to accomplish that without a finger in the photo) to the rustic, charred-chic (if that could be a thing) backdrop. Uh uh, I decided as I stared, mesmerized, at the salsa's beautiful warm coral, freesia and cantaloupe hues. These tacos are not real. They are meant to be stared at and ruminated over, a Rembrant of aesthetic pleasure and thought. A work of such caliber of beauty cannot also bring pleasure to the tongue. Then I read the ingredients, and thought: ok, these actually look like they would taste really good. 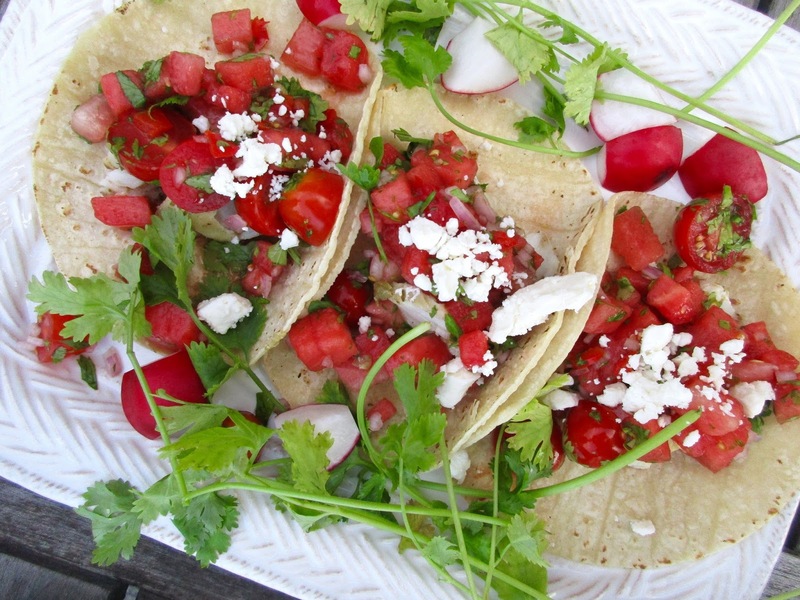 Still grumbling, I set out to make them, waiting for my watermelon to dissolve from flawless cubes into pulpy mush, dampening my not-so-perfectly charred tortillas into flaccid rounds. As I sliced and diced, preoccupied with figuring out how I would explain why my tacos bore so little resemblance to the ravishing originals, I hardly had time to notice the end result. My tacos were beautiful! They were Rembrant tacos, Michelangelo tacos, a visual rainbow of color—and they were tasty AF. 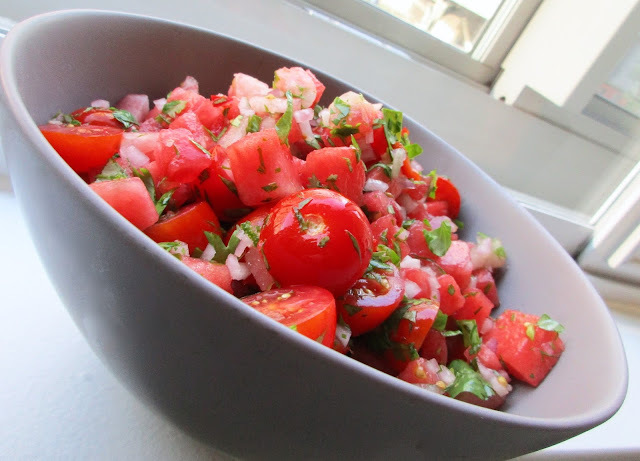 The watermelon was the perfect conduit to temper the bite of the chili, onion, cilantro and chives, and its inherent sweetness soaked up the tangy lime and salt effortlessly. The fish, mild but firm, ensured texture variety within each corn tortilla. Cilantro, radishes, and avocado line the serving platter not only for aesthetics—it also allows guests to pick and choose their garnishes as they please. As quickly as it had come upon me, my jealousy washed away—jealousy is a wasted emotion, after all. 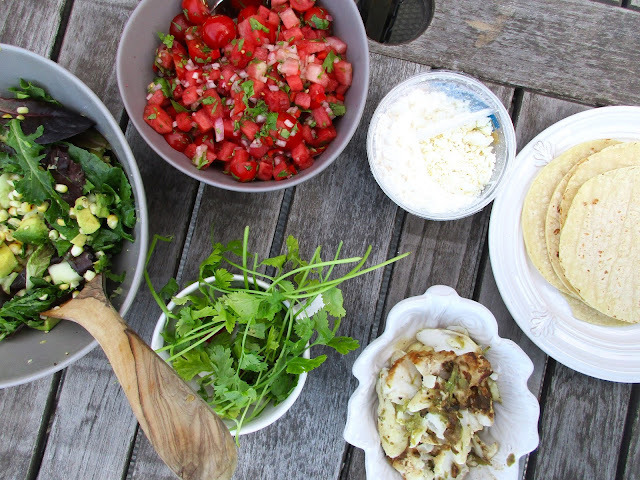 I ate the tacos on my roof, watching the sunset fade into the Hudson, with an easy salad of greens, corn, avocado, and cucumber tossed in nothing more than a little lemon juice and olive oil. As dusk settled and the sun was no more than a sliver of pink behind the clouds, I took a moment to reflect on the intense satisfaction of both my eyes and appetite. Once more, I changed my tune: food doesn't have to be beautiful, but when it pleases more than one of the senses, it feels almost indulgent; a rare, secret treat. 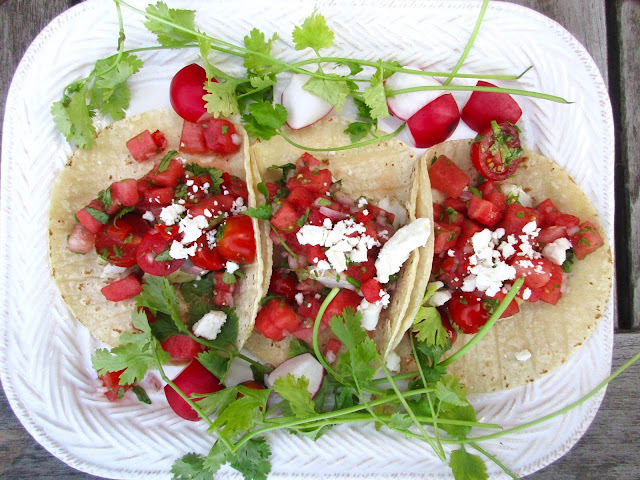 If only I had known earlier that the secret to happiness lies in watermelon tacos! I want to take a second to talk about feedfeed, the site where this recipe hails from. Simply put, feedfeed is a network that connects people who love to cook. The content on their site, organized into various "feeds"such as recipes, community, and videos, is designed to fuel conversation and inspiration amongst likeminded foodies from around the globe. The founders are wholehearted supporters of local and sustainable eating. My favorite part? Their commitment to GrowNYC: feedfeed has a special feed just for meals cooked with NYC greenmarket ingredients. Place the fish in a dish. In a small bowl, combine the oil, lime zest and juice and then grate the chili into the bowl. Mix well and then spoon over the fish. Sprinkle generously with kosher salt and let sit in the refrigerator for about 20 minutes. 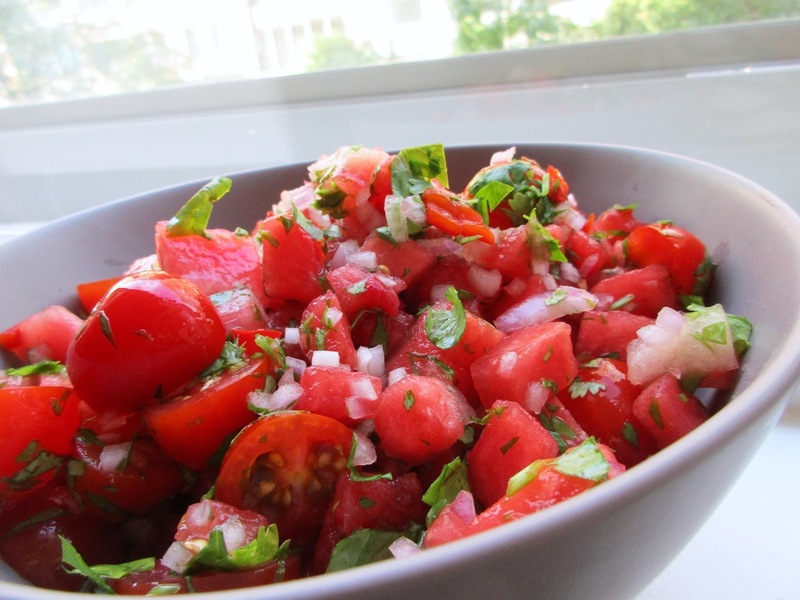 While the fish is marinating, make the watermelon salsa. In a medium bowl, combine the watermelon, cherry tomatoes, onion, chili, and fresh cilantro and chives. Squeeze the lime over the salsa and gently toss. Season to taste with kosher salt. Preheat the grill to medium heat. Place the fish on a piece of foil and place onto the BBQ. Cook 3 -5 minutes on each side, depending on the thickness of the fish. You want it to be just cooked through. When you are done set the fish aside and turn the grill to low heat. (Alternatively, you can cook fish on a stove top for the same amount of time, or in the oven at 400 degrees F for 15 minutes). Let the fish rest for a minute while you spread the vegetable oil over the tortillas evenly and grill each one briefly over low heat until it is barely charred at the edges and hot, soft and pliable. (Or, use my foolproof stovetop tortilla-warming method). Season the fish with a little extra kosher salt. Divide the fish between the tortillas and top each generously with the watermelon salsa and garnishes of your choice.